Look at those bright orange yolks. That’s a direct influence of the daily greens I give our chickens to eat. 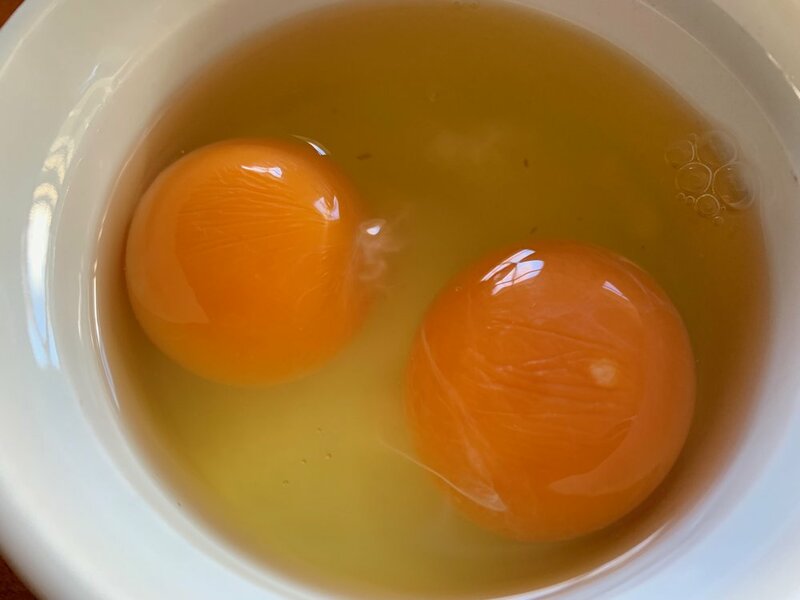 All that good nutrition ends up in the eggs and makes them even more desirable. I love when the days begin to lengthen and we can eat eggs again! Having too many eggs is rarely a problem. Lately I’ve been having a couple for breakfast scrambled with fresh grapefruit on the side. Adam likes ‘em with crispy whites and runny yolks over some sautéed greens and some of my sourdough toast. Poached eggs in a roasted tomato/garlic/basil sauce (which I freeze in jars every summer) is a quick shakshuka, dried chilies added for those who like it spicy. Sopped up with stale bread or a pita, or simply eaten with a soup spoon, it’s hard to beat. Dinner frittatas are a good way to use up excess eggs, because you’ll need 8-12 eggs depending on how hungry everyone is. You can throw in any vegetable you have on hand, fresh or already cooked; bacon or pancetta or crumbled sausage; leftover beans or rice or cheese. We especially love them with greens from the garden, but soon we’ll switch to asparagus or spring peas (that’s not until March, usually). We always finish the frittata with some freshly grated parmesan or a bit of crumbled goat cheese, to give it a spicy salty kick. If I have a lot of eggs and we’re craving a dessert, I like to make chocolate pudding. This recipe from The Kitchn is perfect, because it’s low sugar and high protein and uses plenty of dark chocolate. I make it at least once a month when we have extra eggs. Later this week I’m going to try this recipe from Food + Wine for avgolemono, because not only do we have a lot of eggs, we also have a lot of lemons. Cauliflower starting to head up in our garden - this is the Romenesco kind. February is when all the brassicas start showing up at the Farmers’ markets - broccoli, cabbage, and cauliflower are abundant here because they grow well over the winter and taste even better if touched by a little frost. My go-to way to cook any vegetable is to toss it with oil and salt and roast it in a 425 degree oven for 20-30 minutes, but once in a while it’s nice to have it some other way. Lately we’ve been sautéing them in butter and garlic, which is divine. Recently, the Washington Post posted this recipe for a green curry cauliflower, which is on my short list for weekend cooking. It looks delicious. Cabbage will soon be available and we’ll eat it fresh, as crunchy salad, and make some into sauerkraut. I’ve yet to find a cooked cabbage recipe I like; if you have one, please share it! Overwintered carrots, parsnips, and beets are a frequent sight in February. Carrots and parsnips roasted together are a classic, and even better roasted underneath a salty, buttermilk-brined chicken. You could add some beets to that too, or roast them separately - wash, wrap in foil, then after roasting, slip off the skins. Don’t forget to wash and saute the beet greens, as they are delicious. 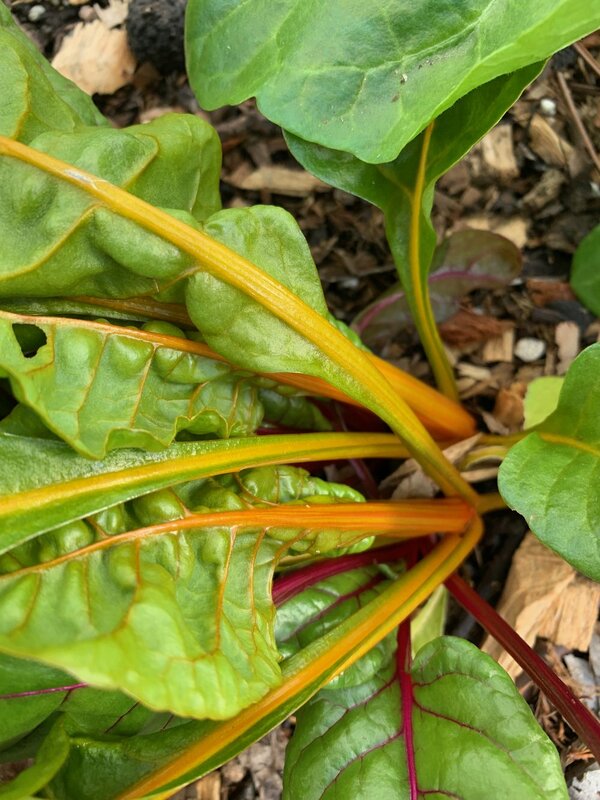 Swiss Chard is in the same family as beets (Chenopodiacea, actually now Amaranthaceae, these things are moving targets), and is a beautiful sturdy green to add to your salads or sautes. Actually, you can make a chard gratin just as you can with any spinach or kale. Or mixed! Delicious, for those who like their vegetables a little richer and cheesier. I grow fava beans (or broad beans) every year as a cover crop in many areas of the garden. Beans and peas form an association with a bacteria that allows nitrogen to be collected from the air in the soil and fixed on the plant roots. If you cut down those plants before they set fruit, the roots (and the nodules of nitrogen) will decompose in the soil and become available to the next set of plants. So I do that a lot in the winter because fava beans are reliable winter growers in California. However this year I’m keen to try some of the fruit, so I’m letting a few plants produce pods. When you talk to folks about eating fava beans, they say two things: They’re delicious, and they’re hard to prepare. That’s because the beans take some extra steps in cooking. Actually, if you eat the pods young, like the one in the photo above, you can eat it whole like you would a string bean. And the leaves are edible too, just like pea shoots! But if you wait until the pod is big and knobbly, you shell the beans out of the pod. Then you have to blanch them in boiling water for a minute, and then slip the inner bean out of its outer coating. It’s like the beans have two coats. Once blanched and shelled that second time, you can saute the beans with butter or oil and they are delicious. I’d love to hear what you’re eating out of your respective gardens! March will bring a plethora of delicious spring foods, and I can hardly wait. 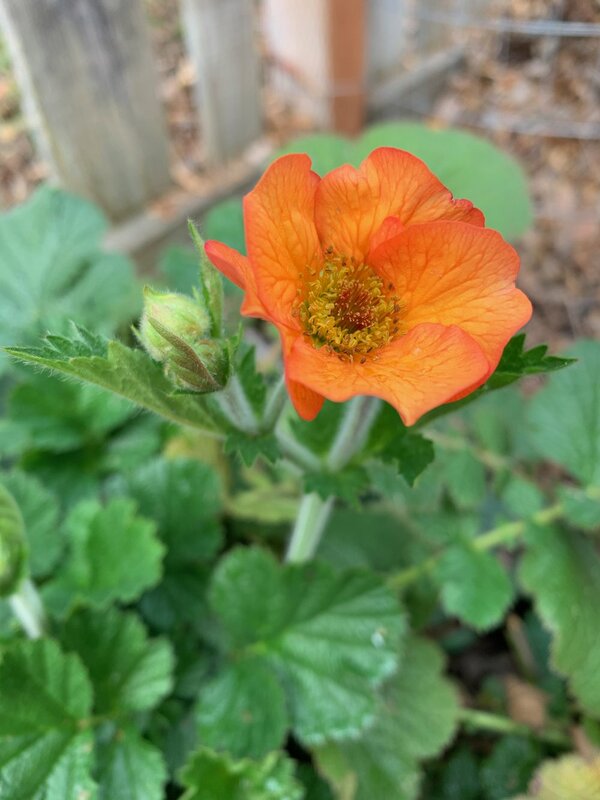 Believe it or not, some Geum plants are blooming!